J Swygart | The Lima News Hardin County Prosecutor Bradford Bailey made his final case to jurors during closing arguments Tuesday at the trial of Tony Sheldon, charged with complicity to attempted aggravated murder and numerous other counts. J Swygart | The Lima News Gerrick "Tony" Sheldon is flanked by his attorneys, Rocky (left) and Jeff Ratliff, as they listened to closing arguments Tuesday in Sheldon's trial in a Hardin County courtroom. 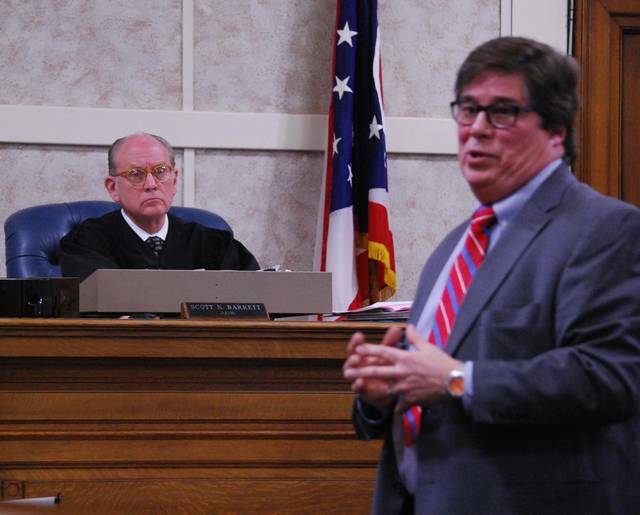 J Swygart | The Lima News Tony Sheldon showed no emotion as guity verdicts on 10 counts were read aloud in Hardin County Common Pleas Court on Tuesday. 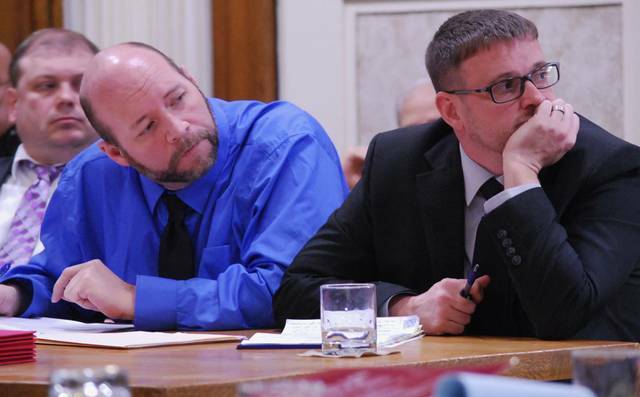 KENTON — Jurors in the trial of Gerrick “Tony” Sheldon deliberated for three hours Tuesday before returning guilty verdicts against the Harrod man on 10 of the 11 counts with which he was charged. The defendant showed no emotion as the verdicts were read aloud in court. Sheldon was indicted on two counts of complicity to attempted aggravated murder, first-degree felonies, and nine other charges related to his alleged plan to have the home of his estranged wife burned to the ground. Other charges included four counts of complicity to aggravated arson, second-degree felonies; two counts of endangering children, first-degree misdemeanors; and single counts of complicity to the unlawful possession of a dangerous ordnance, complicity to possess criminal tools, and complicity to violate a protection order. 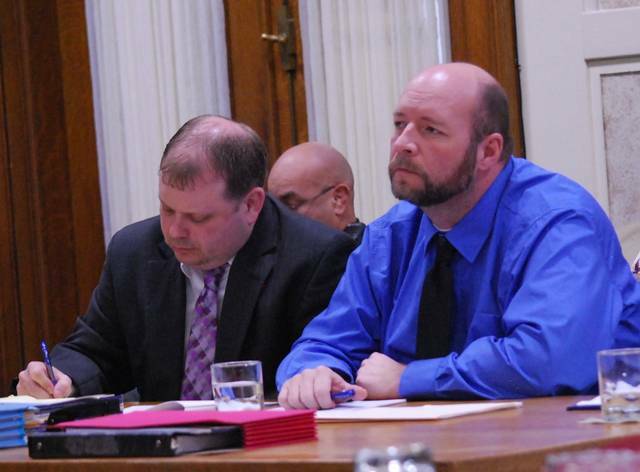 Jurors found Sheldon guilty on all of the charges, with the exception of one count of endangering children. He faces decades behind bars when he is sentenced on May 1. Sheldon, 41, is charged with complicity to attempted aggravated murder and other charges related to his alleged attempt to have another burn down the house of his now-ex wife in August of last year. Prosecutors allege Sheldon devised a plan to have the home of Danielle Sheldon, from whom he was separated at the time and is now divorced, burned to the ground. Prosecutors say he enlisted the aid of his then 15-year-old son, Garrett, to carry out the plan in the early morning hours of Aug. 13, 2017. Garrett Sheldon testified that he told his father he would carry out the act, but had no intention of doing so. He instead made arrangements to let Danielle Sheldon know he would be knocking on the back door of her residence that morning and for her to alert police. While the defense had attempted to paint Garrett Sheldon as the mastermind behind the conspiracy, Bailey singled the teenager out for praise. The prosecutor said the teen stood up to his father, who had abused him on several occasions, and refused to carry out the arson plan. “I commend the boy, not condemn him,” said Bailey. “A boy became a man” on the night in question, he said. Defense attorney Jeff Ratliff told jurors they are obligated to view the defendant as innocent until proven otherwise by evidence presented. Ratliff again pointed to what he believes to be shoddy police work that was tailored to put any and all blame for the alleged incident on Tony Sheldon. And he asked jurors to use plain, old common sense. Tuesday’s proceeding began behind closed doors — outside the presence of the jury and members of the public —and resulted in the dismissal of four charges against the defendant. Judge Scott Barrett granted a Criminal Rule 29 motion submitted by defense attorneys that four counts of complicity to commit aggravated burglary contained in the grand jury indictment were not applicable based on testimony presented at trial. https://www.limaohio.com/wp-content/uploads/sites/54/2018/04/web1_judge-and-brad.jpgJ Swygart | The Lima News Hardin County Prosecutor Bradford Bailey made his final case to jurors during closing arguments Tuesday at the trial of Tony Sheldon, charged with complicity to attempted aggravated murder and numerous other counts. 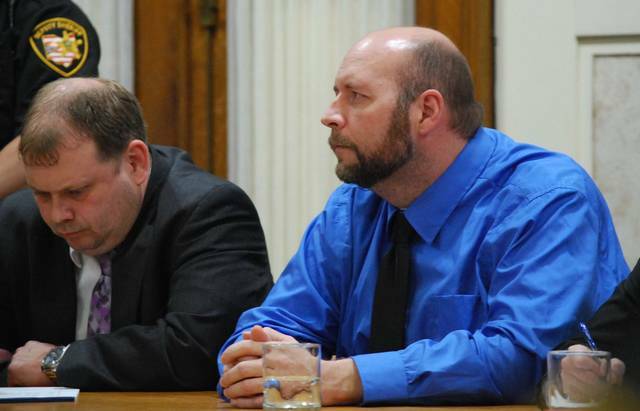 https://www.limaohio.com/wp-content/uploads/sites/54/2018/04/web1_defense-table.jpgJ Swygart | The Lima News Gerrick "Tony" Sheldon is flanked by his attorneys, Rocky (left) and Jeff Ratliff, as they listened to closing arguments Tuesday in Sheldon's trial in a Hardin County courtroom. https://www.limaohio.com/wp-content/uploads/sites/54/2018/04/web1_DSC_0106.jpgJ Swygart | The Lima News Tony Sheldon showed no emotion as guity verdicts on 10 counts were read aloud in Hardin County Common Pleas Court on Tuesday.